Thuraya has 2 satellites in geosynchronous orbit (Thuraya 2and Thuraya 3). The Thuraya 1 satellite originally launched for testing purposes, has now reached the end of it's life and remains in junk orbit above Korea. Coverage is not worldwide, and mainly covers Europe, North and Central Africa and across the Middle East through parts of Asia. 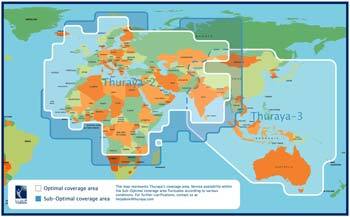 The Thuraya 3 satellite was launched to cover far East Asia and Australia. Thuraya allows you to roam with your handset across nearly one third of the globe. If you are in Thuraya's coverage area you can call to, and receive a call from, anywhere in the world. Even outside the Thuraya coverage area you will still be able to use your Thuraya phone in GSM mode, through a Thuraya GSM roaming partner. The handset can be used as a Satellite only, GSM only, or auto switching between the two, subject to the type of airtime package chosen. 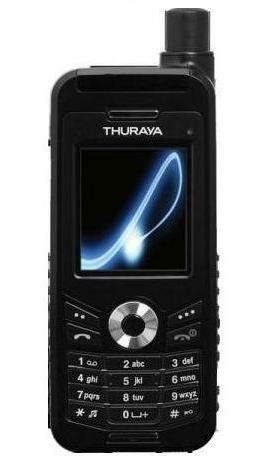 The Thuraya XT is Thuraya's latest handheld satellite phone. Find out more here.